NBC's Brian Williams speaks with New Jersey Gov. Chris Christie, who describes the iconic places on the Jersey Shore that have been wiped out after Sandy, such the boardwalk in Belmar. All that remains is water, sand and debris. Christie said he's committed to rebuilding with the help of the U.S. Army Corps of Engineers. 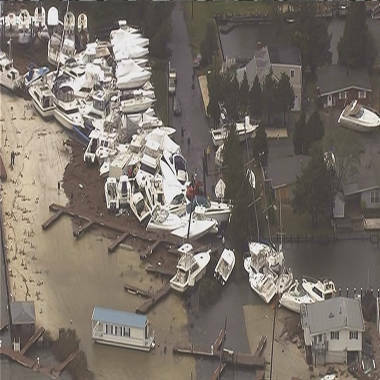 An ariel shot reveals damage in New Jersey Shore from Superstorm Sandy on Tuesday. The New Jersey Shore, the East Coast’s summer playground, famous for its amusement parks, fine white sand beaches, family vacation cottages and even a reality TV show, could be among areas hardest hit by Superstorm Sandy. On Tuesday, stark images of leveled homes, shredded boardwalks, boats tossed blocks inland and acres of sand hurled hundreds of yards from the coast began to emerge. Aerial video on Thursday from state police via NBC’s News10 in Philadelphia showed homes splintered and others surrounded by floodwaters. In footage from a New Jersey National Guard helicopter, beach homes along Seaside Heights were strewn at odd angles off their foundations, debris was on fire and roads were inundated with sand. One reader commented on Facebook that it looked like Normandy Beach, site of the allied forces landing in France during World War II. According to a media pool reporter who accompanied Coast Guard Rear Adm. Steven H. Ratti in a flyover on Tuesday the destruction is extensive. Ratti said he was surprised at the number of washed-out bridges and new inlets carved through New Jersey's barrier Islands. Ratti also noted how unusual it is to see those beach towns so empty. "Normally you see folks on the beach, cars, but saw little of that today," Ratti said. In an appearance on NBC Nightly News with Brian Williams Tuesday evening, Gov. Chris Christie called the damage "unthinkable." "I flew over the Seaside Heights boardwalk today. The roller coaster, the log flume ride are in the ocean," Christie told Williams. "The boardwalk in front of Lucky Leos is gone. It’s literally gone. The big sausage and pepper stand in the middle is gone." Christie said that kind of damage could be seen up and down the Jersey Shore. "All you see is water and sand and debris where the boardwalk used to be," Christie said of Belmar. "I’m committed to rebuilding," Christie said. "We’re going to do it. It’s not only the heart of our economy, it’s the soul of New Jersey. The Jersey Shore is the soul of New Jersey." A dune constructed to protect Point Pleasant Beach was blown away by the storm surge, sending sand far inland, NBC’s Ron Mott reported. Reporting from Point Pleasant Beach, New Jersey, NBC's Ron Allen reports that the sand dunes designed to help protect the town were spread far and wide once floodwaters hit. The deadly storm, which hit the Atlantic City dead on and ripped up sections of its famous boardwalk, left more than 2 million people in the state without power and submerged portions of some shore towns, NBC10 in Philadelphia reported. Atlantic City was cut off from the mainland by the storm surge along with other barrier islands, stranding residents who ignored warnings to evacuate. The city’s response sparked a feud between the mayor and governor. A USA Today reporter who visited Fork River spoke to a Beach Haven resident, Erik Zak, who said much of the town was destroyed. "There are boats on top of decks, garages floated into the bay," he said. "We saw houses on top of boats." 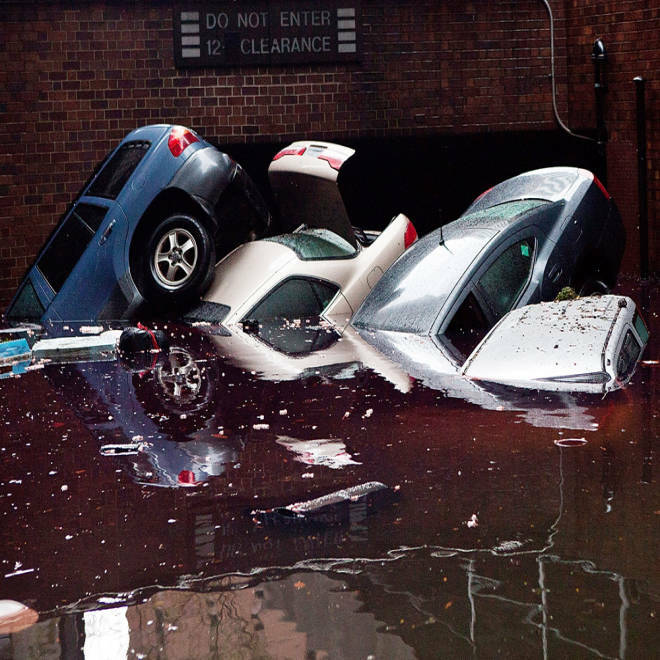 President Barack Obama has declared New Jersey a disaster area, clearing the way for federal disaster assistance to help start cleanup. On Wednesday, Obama will join Christie in New Jersey for a tour of storm damage and a talk with residents who are recovering from the storm. He will also talk to first responders, according to a White House statement.